When you plan the big day, every detail is important. You want your guests to have an unforgettable experience at your wedding. One of the key things to consider is the food. Many couples choose barbeque catering for weddings simply because people love grilled food no matter if it is meat or veggies. But how do you pick the right service among the various options available. Here are some essential tips to help you with this. When people think about BBQ, they usually imagine succulent meat, fresh salad, great sauces and some pickles to make things perfect. Since it’s your wedding, it is up to you to decide what to include in the menu list. It is always better to focus on diversity rather than to rely on your taste solely while minding your budget, of course. Nowadays, it’s essential to provide for vegetarians. 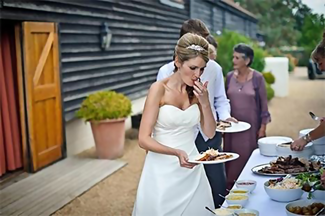 Most companies specializing in barbeque catering for weddings offer this option. You should also consider having a kids’ buffet. This will not only make children and their parents overly happy, but can help you bring down costs too. It may go without saying, but you must try the food before making any further arrangements. Checking out reviews is always a good idea, but you have to have a clear idea of what you and your guests will be eating at your wedding. Besides, sampling will allow you to choose the best dishes from the salad to the meat, veggies and sauces. Usually, the bride and groom will do the sampling together, but you can also take “an intermediary” with you just to be on the safe side. When you hire a company specialized in barbeque catering for weddings, you should expect to get not only great food, but also everything needed for its serving and consumption. It is hard to think of everything that will be necessary, but it pays off to prepare a list and compare the items to what the provider has to offer. Remember to dig deeper. When the catering company says that they will provide plates, confirm that they are big enough and that they are made from the right kind of material given the style of your reception. Make sure that clean-up is included in the package. A company offers great food and fine tableware, but is this sufficient for hiring them? You should definitely take a look a closer look at the overall service which you will receive. Is the company known for being punctual? You wouldn’t want your guests to wait for getting the fine meal which you have planned for. How about the staff members who will be serving food at your reception? They should be friendly and experienced too. Another one of the major qualities which you need to look for is flexibility. The catering company should be able to react quickly and effectively if something unexpected comes up. 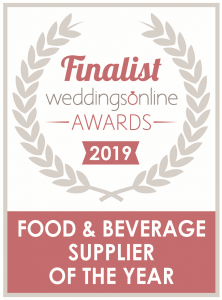 You are now well prepared to get the ideal barbecue catering for weddings on the most important day of your life.